As per sthala purana, the vedas were protected in a pot made out of the tough mud at this place during pralaya. On Thai(Jan/feb) Pushyam day, the Lord is taken in Procession on temple car with five Thayars (Sridevi, Bhoodevi, Neeladevi, Mahalakshmi & Saranayaki.). It is believed that worshipping this Lord after a bath in sara pushkarni removes all difficulties and curses. 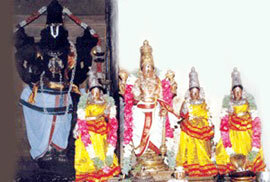 A Sannadhi for Rajagopalaswamy is inside this temple. Lord Sri Rama gives us a very special dharshan here. Along with Devi Sita and Lakshmana, all Alwars and Sri Rama's kolam (ie) he poses as he was found in forest for 14 years. Mudikondan river flows on the west and Kudamuruti river in the south. Lord Hanuman (Aanjaneya) blesses from the west end of the pushkarani and Lord Vianayaka from the North eastern side. Thaayaar - Saaranayagi ( Saara Naachiyaar). This Kshetra is also called as " Panchasara Kshetra " .There are five nachiyars here. River Cauvery flows South of Sara Pushkarini. Access to the temple About 3 miles from Thirunaraiyoor. About 16 Kms from Kumbakonam on the Kumbakonam - Thiruvaroor Road. The Moolavar of this kshetram is Saranathan Perumal. The Moolavar is giving his seva in standing posture with his face facing the east direction. Prathyaksham for River Cauvery and Markandeya Maharishi. This temples is at the 7th mile from Kumbakonam on Kumbakonam-Thiruvarur route. The temple is on road-side and no much facilities are available here. Either we had stay at Kumbakonam or at Oppiliyapar Temple and visit this temple.